Alfred Myrick Pound was born on Prince Edward Island. In his twenties Pound abandoned his legal studies to work at the St. John Telegraph, but he resumed his interest in law after settling in Vancouver in 1900. In 1901 he entered into partnership in the firm Champion & Pound. He was interested in B.C. literature and was a member of the Canadian Authors' Association, the Vancouver Poetry Society and the Vagabond Club. Pound occasionally wrote articles, usually biographies, for newspapers and magazines. Pound's library was one of the best private collections in Canada and was especially rich in the works of his friends Bliss Carman and Sir Charles G.D. Roberts. The fonds consists of Pound's letters, addresses, criticisms and biographical sketches. It also includes material pertaining to Charles G.D. Roberts and Bliss Carman. 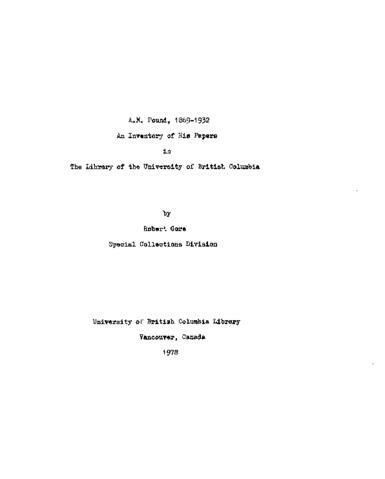 There is also general information about Pound, Roberts and Carman, with manuscripts of poetry and prose, newspaper and magazine clippings, scrapbooks, photographs of Canadian authors and poets, and other items.